Lil Wayne's lyrics reference Emmett Till, a black US teen whose murder in the 50s for allegedly whistling at a white woman changed the national conversation on race and civil rights. 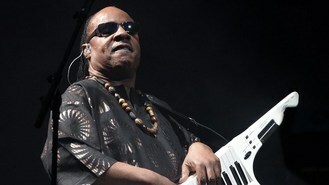 RnB legend Stevie said the rapper's verse should not have made it beyond the recording studio for the world to hear. "You can't equate that to Emmett Till," he said. "You just cannot do that... I think you got to have someone around you that - even if they are the same age or older - is wiser to say, 'Yo, that's not happening. Don't do that'." Stevie, who said he is a fan and friend of Lil Wayne, made the comments when asked what he thought of the controversial lyrics in an interview. On a remix to Future's song Karate Chop, Lil Wayne made a sexual reference involving the brutal death of Emmett, a 14-year-old Chicago boy tortured and shot in Mississippi in 1955. Emmett's family has asked the rapper for an apology, and Epic Records, Future's label, said the official song will not feature the vulgar words and is employing "great efforts" to pull it down. Stevie, 62, said he hopes the 30-year-old Grammy winner understands the perspective of the Till family and chooses his words wisely in the future. "Sometimes people have to put themselves in the place of people who they are talking about," he said. "Imagine if that happened to your mother, brother, daughter or your son. How would you feel? Have some discernment before we say certain things. That goes for me or any other (song)writer."